As always, I'm agog and delighted by this post. One small note about tombstones and realism... I live in London, and we abound with old graveyards. My local one is Bunhill Cemetery, which was also a plague pit (Bunhill from "Bone Hill" because the ground is about a yard higher than its surroundings, thanks to all the dead in there). 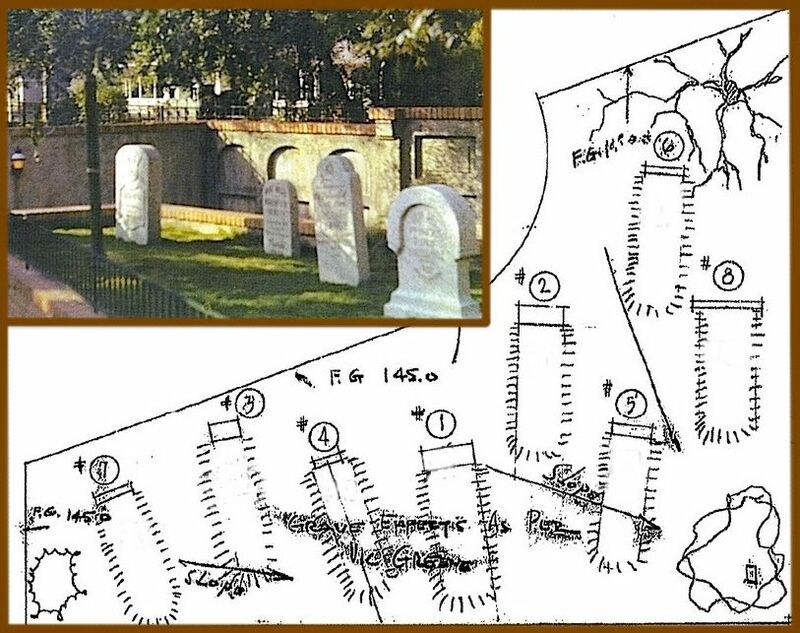 Over the years, so many disasters, so much neglect, so much upheaval has attended Bunhill that many of the tombstones are simply leaned on the fences or even used as flagstones on the pathway. So there's historical precedent for properly auld cemeteries sporting tombstones with no proper room for a grave before them. PS: Bunhill's got Blake, Bunyan, Bayes, and assorted Cromwells! Is there anything that proves, without a shadow of a doubt, that the ghosts have never been visible before "today"? Long time reader, first time commenter. I absolutely love your blog. 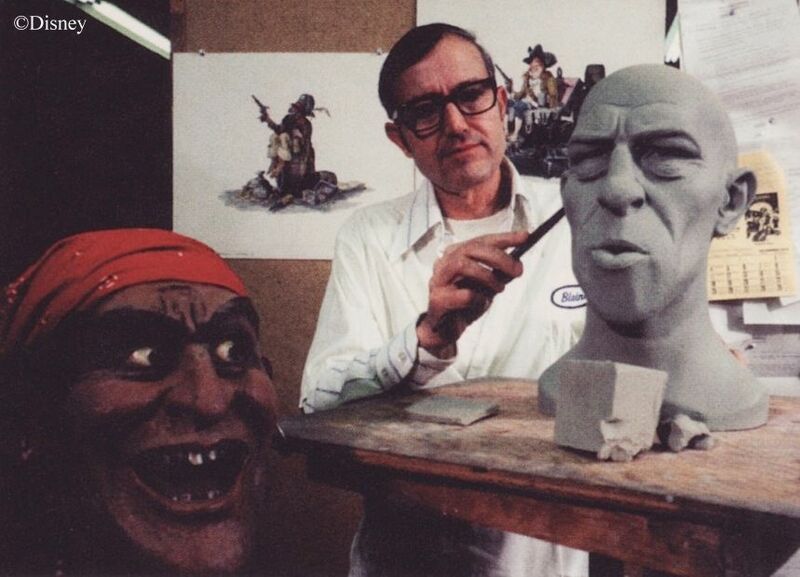 I thought I knew everything about HM before I came, and while I knew a lot about Ken Anderson's influence on the attraction, I had no idea how far it went. Always a good read! This great post's reference to the HM's atmospheric progression (scary -> free the spirits -> silly) gives rise to a theory --obviously conjecture outside of what any imagineer might have thought. What if the only "bad" spirit in the mansion is the bride? She's the only one with the power to break through and menace you (a common troupe in ghost films, where the most evil has the most power); when your vibrations free the others, they begin to take over and the bride's influence begins to wane; you get one last shock in the attic and then it's all "silly" ghosts from then on out. You talk about the things that make the ride endearing; I've only been on it once decades ago and yet it's endless entertaining to read your incredibly well researched blog and to connect the dots in ways not thought (maybe) by it's original creators. Great posting. You've really nailed a lot of the problems with the new queue. I think you've also hit on what should have been done! I understand WDIs desire to put an interactive queue at the mansion (I don't shate it, but I understand it). But what they should have done was gone with the Museum of the Weird idea. This would have been a perfect opportunity for guest interaction and they wouldn't have had to mess with the mansion's backstory to do it. They could just say that a recent owner had a penchant for collecting odd ball items (perhaps some that are cursed). They probably could have reworked many of the same gags (but without spoiling the ride). And they still would have gotten their tributes in. Win win for everyone. Sigh. It's true that old cemeteries turn shabby, but (1) this one is only about 200 years old, and (2) it's a private, family plot. I would think that even London's cemeteries would have a tough time going to pot under those two conditions. For proof that this is indeed the first time these ghosts have materialized at the HM, see the previous post (Let's Get Real). "What if...?" I'm not much of a fan of fanfic, except to point out that the HM's high degree of logical consistency emboldens speculations about its past and present history in a way other such attractions do not. I'm not surprised that some people love to do it. Gordon, an actual Musuem of the Weird as the interactive element is a brilliant idea. And they could even get Rolly to help design it. I should have noted that "upper management" decreed that there must be an interactive thingabob at the WDW HM, and that some decisions for Carsillo's team were already handed to them. To his credit, he also successfully resisted some of the very worst ideas. But still, it's normal for these guys to have to make lemonade out of the lemons given to them. They didn't have to alter the concept of the ride itself. Clearly those at WDI have abandoned Walt's way. Harsh as this review is, I wouldn't want it to be construed as a blanket indictment of WDI. There are good people in there who "get it." Would that only such people had their hands on the big levers. (HBG2 wrote) "What if...?" I'm not much of a fan of fanfic, except to point out that the HM's high degree of logical consistency emboldens speculations about its past and present history in a way other such attractions do not. I'm not surprised that some people love to do it. Right, I wasn't meaning to dip into the pool of fanfic, but basically point out that leaving a lot of "mystery" in the story allows you to be drawn further into a realm, which is sort of a follow-up on another direction from your post. Spelling everything out destroys that possibility. For instance, if you have the picture of the captain and the ship, you have to imagine what happened, why, and when, and what that has to do with the mansion. Now he drowned in a bathtub while living in the mansion. Comical, maybe, but leaves no interpretation. Following this blog, it seems each change gets more into "telling" then "showing". That's one of my beefs with Constance. I don't want to hear stories about residents of the Mansion. Less is more, MUCH more. But again, at least those Imagineers got the premise basically right. All you know about Constance is what you would find out during an actual visit to the house. Stuff happens to be lying around in the attic with names and dates in sensible, believable spots (believable enough, at least, for a suspension of disbelief, believable within the rules of "realistic presentation"). "For proof that this is indeed the first time these ghosts have materialized at the HM, see the previous post (Let's Get Real)." If I'm understanding you correctly, you're saying that the ghosts have all been trapped in the walls and furnishings of the building until "today" when Madame Leota sets them free. Doesn't that contradict the idea that the ghosts have retired to the mansion, and are able to come and go as they please? I just see Madame Leota as helping the invisible to become visible, not freeing ghosts who were previously trapped. BTW, the tomb is for a composer. It's not necessarily the organist's tomb. They've come to retire there, but once taking possession of the house, they've found that they have been unable to materialize independently. I don't find anything suggesting that they've been free to "come and go as they please" or that any of the ghosts have materialized previously. But the Caretaker's astonishment, the frustration and anger of the Conservatory/CoD ghosts, and the Disney penchant for premising rides as unique events all argue that you are witnessing the first time this has happened. In light of this, the burden of proof lies with the "frequent occurrence" theorists. Can you prove that they do this sort of thing all the time? Claiming that the organ crypt is not necessarily the organist's tomb is special pleading. That's the obvious inference from the elaborate organ on the end. I can't prove, but here is an argument to the "frequent occurence": the lyrics of Grim Grinning Ghosts. "When the moon climbs high over the dead oak trees", "when the crypt doors creek"… All that means to me that the grim grinning ghosts coming out to socialize is not daily, but a thing that happens regularly. Although it's a cliché, perhaps it happens on each full moon, given "as the moon climbs high…", but there is a most interesting theory: they can only materialize when someone enters the mansion, which is not often, and shares a Séance with Madam Leota, which is even rarer. 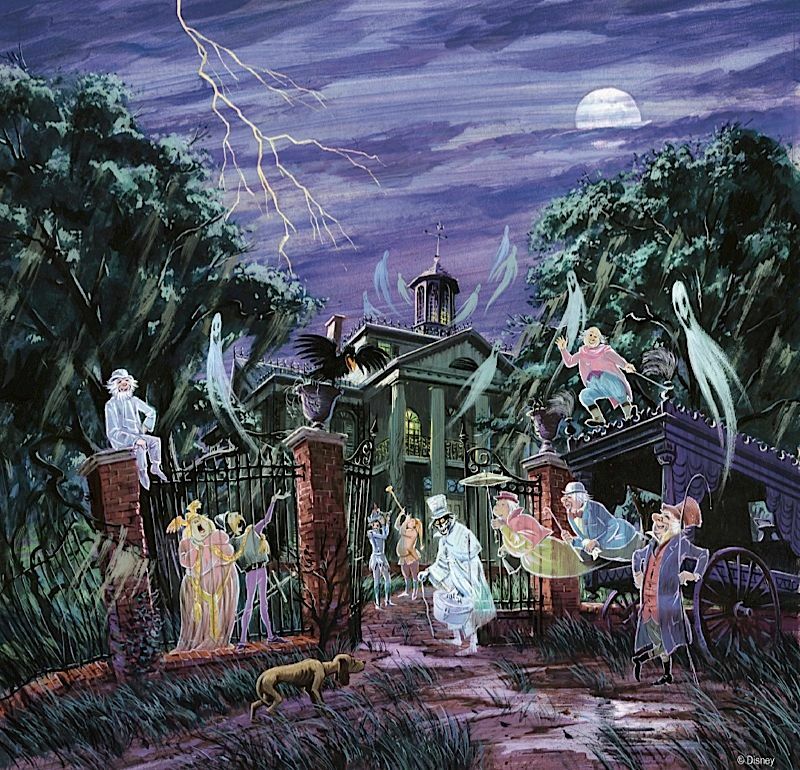 The graveyard jamboree would be some kind of softer version of the Night on Bald Mountain: most of the time the spooks are invisible, but once or twice a year they have a big party lasting one night. At the morning, or shortly after the visitors leave, they dematerialize again, and they need to wait the next visitors to materialize again. The dying voices that sing the last verses of Grim Grinning Ghosts "if you would like to join our jamboree…" are the ghosts slowly returning to their immaterial selves as we leave. And maybe Little Leota enjoys the party so much that she wants us back soon so that they can party again. What do you think of this version ? I think this can qualify as more comprehensive in that it includes more evidences left out by yours: namely, the lyrics of the song that seem to imply that "each time those conditions are reunited, we materialize", and the "dying voices" at the end which sound nothing like the very much alive and loud voices during the Graveyard scene. What do I think? I think I'm tired of saying the same things over and over. The present tense is grammatically ambiguous. It can refer to things happening as a regular occurrence OR to future events OR it can simply be stating what is happening at the moment. Nothing in GGG suggests that this has ever happened before unless you choose to read it that way. You know, it's possible that we are so paralyzed by terror that we hallucinate the Caretaker as a projection of our own fears, and since it's the first time for us, it's the first time for him, when in reality this happens all the time. There, how's that? You can do that crap all day long. But the simplest explanation that accounts for all the facts is to be preferred. Occam's Razor. The Caretaker figure virtually tells us that this has never happened before. End of debate. I'm not interested in "Yes, but what if this and what if that" imaginative scenarios. Why aren't you? You've been shaving Occam for too long now. Occam's Razor is a reasonable scientific principle, but if you occamize too much in art and entertainment, it just becomes boring, methinks. Once one has explored all the solid facts about the Mansion's real-life history (as you have most thoroughly done with this blog) and unearthed all the easter eggs that are really there, cooking up fan theories and ideas about the Happy Haunts' life and afterlife is the obvious next step to keep squeezing more enjoyment out of the ride. And that, if you're imaginative enough, can keep you entertained forever. Sorry, no, Occam's Razor applies to any kind of rational argumentation. People are free to come up with private, subjective interpretations all they want. That's fine. Go for it. But if you say to someone else, "Here's what I think it is," you are now making claims about objective reality and need actual evidence and logical argument. No one is obliged to accept your private interpretation of an artwork as credible just because it is to you. Quote: "I just see Madame Leota as helping the invisible to become visible, not freeing ghosts who were previously trapped." "Unfortunately, they all seem to have trouble getting through. Perhaps Madame Leota can establish contact. She has a remarkable head for materializing the disembodied." That's an original part of the GH's dialogue during the CoD. It's been on and off several times since 1969. How is that a counter-argument? "Getting through" implies communication. They're trying to get through to you. Madame Leota is trying to establish contact. The hhosts want to get to know you. They wouldn't have a problem with being immaterial if not for the necessity to communicate with you.
" 'Getting through' implies communication." No it doesn't. "They wouldn't have a problem with being immaterial if not for the necessity to communicate with you." Says who? And what about the obvious fact that once they have "gotten through" and are materialized, they don't proceed to talk to you or show any interest in doing so? The ghosts are dying to meet you face to face, but they're floating around as blobs of invisible, formless energy. They're having trouble getting through to you, until Madame Leota and your sympathetic vibrations give them a temporary visible form. They want you to see them. They take pleasure in frightening you by making ghastly noises and possessing the walls and paintings. Some of them levitate objects, like the candelabra. They're "practicing their terror with ghoulish delight," as the GH says. A few of them are stuck and confused, like the coffin occupant and the people behind the doors. They don't realize they're dead and/or haven't figured out how to separate from their former physical bodies. As for being free to come and go as they please, notice the stream of ghosts just arriving to the mansion through the ballroom doors. These are guests to the party, who came from elsewhere in the spirit world. 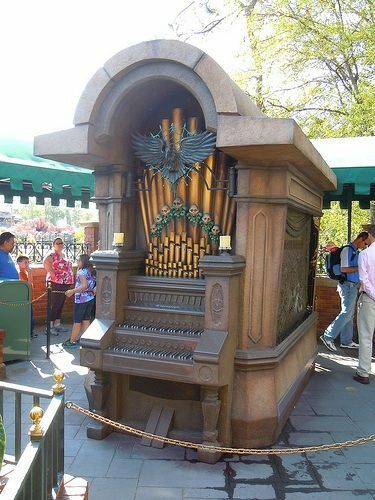 As for the composer tomb, the guy wrote "Grim Grinning Ghosts." He was in touch with the supernatural and the spirits. The organist doesn't have to be the composer. 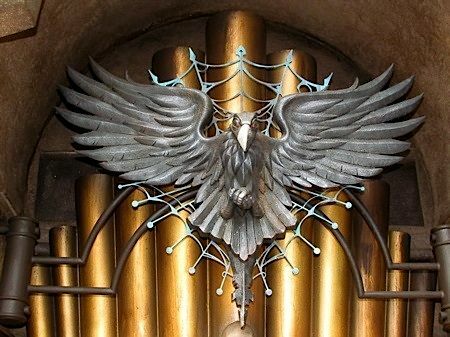 Like the Phantom Five, the organist could be just another ghost playing the composer's music (who wrote for pipe organ, harp, bagpipes, flute, weird instruments from the beyond, etc). There are possible reasons why the raven would be there. The composer may have had some kind of curse placed on him and he was forced to write music for the ghosts, while the ominous raven kept a close watch on him. The music in the HM could have a genuine story reason, other than just providing a spooky soundtrack. From Ken Anderson's Bloodmere Manor: "The house has a supernatural, musical atmosphere that we must get in tune with so as not to irritate the spirits as we pass through." Yes, "today is your lucky day" in the ride. It doesn't mean the ghosts have never appeared before. More from Ken Anderson's Bloodmere Manor: "Now we cannot promise you that anything at all will occur during your visit...since it is usually in the wee small hours that the dead ones live it up... However, be prepared to see and hear something or other, and take whatever precautions you please." Anything can be possible if you engage in enough special pleading, but I go with Occam's Razor: The simplest explanation that accounts for all the evidence is to be preferred. No explanation for the old Caretaker's expression is simpler than, "He's never seen anything like this before." No explanation for the prominent replica of the ballroom organ on the crypt is simpler than, "The organist is buried here." You need to prove more than the possibility of your alternate explanations; you also need to prove that they are simpler and more comprehensive explanations. Yes, that particular caretaker has never seen anything like this before. There could be a rapid turnover rate of new night watchmen, due to them being scared off. It doesn't mean a ghostly party happens every night in the graveyard. But paranormal activity often occurs, and the caretaker we see is the new guy on the job. Another of Ken Anderson's Bloodmere Manor ideas was that night watchmen were employed to catch vandals red-handed (believed to breaking windows and such), but were unable to report anything but weird and frightening apparitions. "Yes, but it could be that..." = special pleading = fail. If your alternate explanations are not simpler or more comprehensive, they're non-starters. Also, Anderson's scenarios are irrelevant. "Also, Anderson's scenarios are irrelevant." Not really, since the guys in charge of the final product were obviously familiar with his conceptual work. Since Ken's work was only an influence, it can only be relevant in supporting possible explanations for what the Imagineers were up to. As I keep saying, you need more than that just to get started. Not just "possible" explanations but "simpler" and "more comprehensive" explanations. If what you propose isn't one or the other of those, then they're just exercises in your ingenuity, not arguments, and quoting Anderson doesn't do anything to overcome that deficit. Which is the simpler explanation? a. Ghosts from all over the world came to "retire" at the mansion, but it was a trap! They've really screwed themselves over, and now they're stuck in the walls until the same day that you happen to show up. b. Ghosts from all over the world came to "retire" at the mansion because it's a happenin' place. Usually they're invisible to humans. Today's your lucky day - you get to see some. You're not paying attention. The simplest and most comprehensive explanation wins. The winning explanation must explain all the evidence in the simplest possible way. Option B first of all does not explain all the evidence. We are explicitly told that they are all having trouble "getting through", and Mdm L may be able to fix it so they can materialize. Option B explains other evidence only by resorting to special pleading (maybe the Caretaker is new on the job; maybe the angry/frustrated ghosts are atypical). Option A explains all of the evidence without special pleading. Option A is therefore simpler. And when I used "This is your lucky day" as a description of the preferred Disney ride scenario, I meant very specifically "This is a unique event you're seeing." Disney prefers to present ride experiences as witnessing unique events. The burden of proof falls on you to show that the HM is an exception to their usual practice. If all of the ghosts are so terribly trapped and angry, what's with the GH proudly stating that there are 999 happy haunts living there? "Disney prefers to present ride experiences as witnessing unique events. The burden of proof falls on you to show that the HM is an exception to their usual practice." I'm not saying this ghostly party is a nightly occurrence at the HM. It's a special occasion, not arguing that. As are the events in Pirates, Jungle Cruise, etc. Doesn't mean the pirates never previously pillaged and plundered a city. What you see in that ride is a particular event related to a curse. Doesn't mean people taking a jungle cruise never before saw any elephants or hippos. You happen to drift through the jungle when headhunters are dancing and men are pursued by a rhino, but most of the stuff you see is business as usual. Yes, it's a unique event that you're experiencing in the HM, but that doesn't mean that a free-floating spirit has NEVER visibly appeared in the mansion's history before now. The caretaker doesn't have to be a new guy. Really doesn't make a difference if he is or isn't. He could have been working in the graveyard for several years, not seeing anything too out of the ordinary. Maybe a light in the window of the house now and again... until, one day... when there's this huge ghost party that extends from the mansion and into the graveyard. Doesn't mean people who have been in the house have never seen a visible ghost. Sorry, but I'm a little hung up on the guy in the coffin right now. Aside from the horrifying suggestion that he gets re-trapped in his body in the coffin every now and then, the age of the flowers around the coffin and the urgency with which he pleads for assistance, I am persuaded that at the very least, this is the first time this has happened to him. Definitely first time for him. He's confused and might still think he's alive. Perhaps we are misconstruing the idea that the HM is actually a "retirement home?" That's the PR and marketing talking, isn't it? And even so, why would they be free to go? Maybe the house is just haunted in the first place. "Notice! All ghosts and restless spirits. Post-lifetime leases are now available in this Haunted Mansion. Don't be left out in the sunshine! Enjoy active retirement in this country club atmosphere, the fashionable address for famous ghosts, ghosts trying to make a name for themselves...and ghosts afraid to live by themselves! Leases include License to scare the daylights out of guests visiting the Portrait Gallery, Museum of the Supernatural, graveyard and other happy haunting grounds. For reservations send resume of past experience to: Ghost Relations Dept. Disneyland. Please! Do not apply in person." This doesn't sound like some kind of prison for ghosts. "We have 999 happy haunts"
"Unfortunately, they all seem to be having trouble"
The GH says both of those things, but they can't both be completely true. One of them must be at least partially ironic. Which? 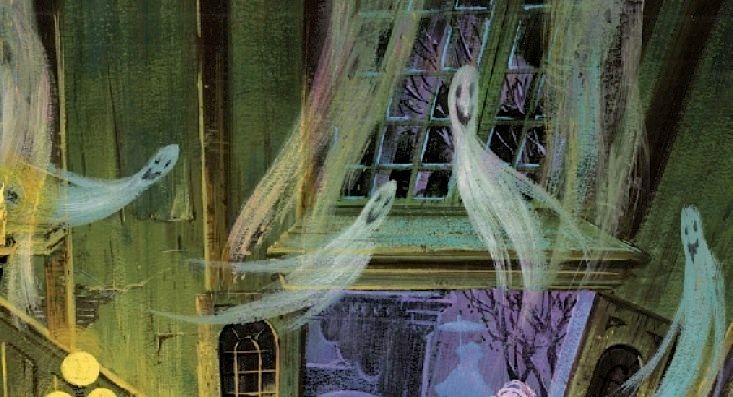 Fortunately, we don't have to guess: we can see and hear for ourselves how unhappy they are as he speaks the second line, whereas we never see or hear for ourselves any happy ghosts (before Leota). We do not have a choice: The first line must be the one that is tongue-in-cheek, at least partially. But if his characterization of the residents as "happy" is at best unreliable, it cannot be used as evidence to prove anything. The "old caretaker" (sometimes "the gardener") is a stock character. That's why most people recognize him immediately. He's always the guy who's been around the place a long time and is deeply familiar with it. 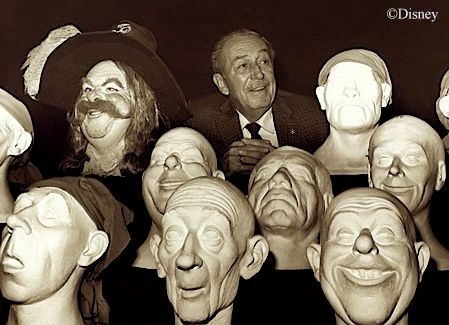 If the Imagineers employ a stock character, you darn well better take it at face value unless there is hard evidence that they don't want you to. They have gone out of their way to make "the old caretaker" look as flabbergasted as possible. In my opinion, they could hardly have said it more plainly: "this has never happened before." Any other interpretation of that figure is special pleading and cannot be taken seriously. And since ghosts are freely floating in and out of the ballroom, there is evidently no distinction between inside and outside ghosts. I call that strong proof that what you are seeing has never happened before. Unless one can refute that, there is no point in pursuing these other trivialities. Quote: "we can see and hear for ourselves how unhappy they are as he speaks the second line, whereas we never see or hear for ourselves any happy ghosts (before Leota)." Not true. There's plenty of laughter going on in the Corridor of Doors. What about the Ghost Host? He's a happy. He's a ghost. He's floating around. Why would he be any different from the other ghosts? He's just the tour guide. What about the gusts of air and the floating candelabra? The suit of armor? The raven? Those spirits undoubtedly aren't trapped in the walls. "That is the time when ghosts are present, practicing their terror with ghoulish delight." "That is the time when ghosts are present, pissed off because they're stuck in the wall, wondering how they got duped into coming to this supposedly awesome ghost country club only to be trapped in the architecture." The graveyard caretaker has never seen a ghost before. So? He's one person. People living in the mansion could have seen plenty of ghosts. It's not like the ghosts materialize and then remain visible to people forever. Why don't you see them hanging around at the exit of the ride? They're back to being invisible. Cue Candy Candido laughter. Going by your ghosts trapped in the building theory, once you exit the ride, the mansion should be totally decrepit (like in the graveyard scene) and fully visible ghosts should be floating around New Orleans Square. I agree wholeheartedly with your astute and perceptive review of the interactive queue (though I have not yet visited it in person and admit to knowing it only through Youtube clips). Has anyone written a serious review defending and/or praising the queue? If so, could you provide links to their articles? I would be most interested to learn what their thinking is. This long (and interesting) discussion kind of bolsters my point -- what makes the ride have such a fan base is it's easy to put your own spin on it. If I had to bet on it, what's really going on isn't a story, but the same simple theme you see in some ghost stories and movies of the time. First, it's unseen -- noises, shadows (though the coffin is a problem) -- then it's full on ghosts. Like in horror films, monsters are usually proceeded by their shadow, or just a hand, etc, before you get the "money shot" of the monster. Then a story was wrapped around that theme; show their presence first, then the ghosts themselves. It's cinematic. As for the great debate: (1) maniacal laughter ≠ happy; (2) We've demonstrated that the GH is an unreliable narrator ("happy" + "all having trouble"); (3) stock character of old caretaker + "he's ignorant" = special pleading = fail. "People inside could have seen ghosts" + no evidence = special pleading = fail; (4) whether ghosts are trapped in the fabric of the building or just in the rooms of the building comes to the same thing. They all want to materialize and somehow can't. 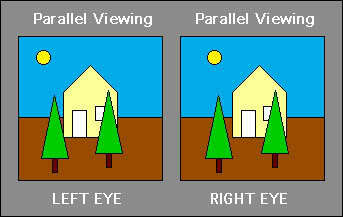 We can trust the GH on that point because it is supported independently by what we see. Before Leota: no visible ghosts, no clear evidence of happy ghosts, plenty of apparently unhappy ghosts. After Leota: visible ghosts, mostly happy ghosts. If the caretaker was apimple-faced kid (like the one who seems to have an entry-level position at every store and restaurant in "The Simpsons") then I'd think there might've been some turnover at the position, but he's just short of 'codger.' He's been doing his job for awhile. 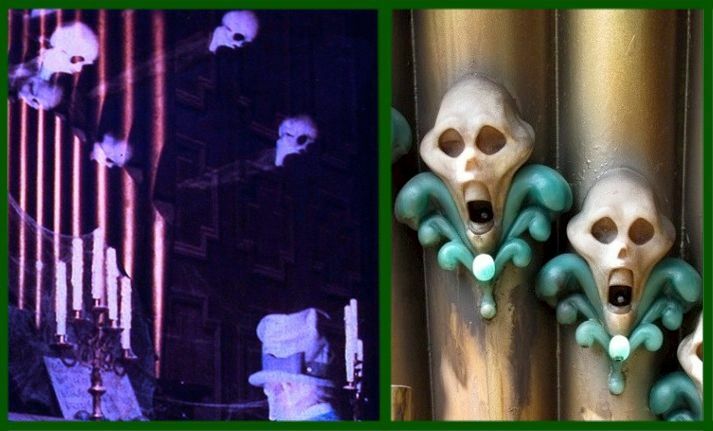 A question that has come to mind is: Who brought Madame Leota into the Mansion? 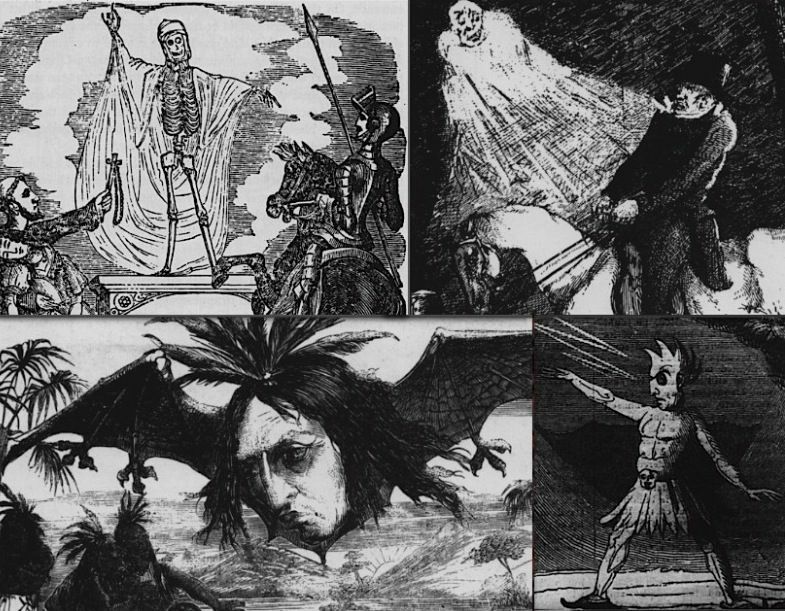 Typically, seances were set up by two people or more for viewing by a small group. There's no sign of a pair of hands with feet that would have arranged her seance set-up. Was she brought in by the same people who abandoned the funeral in the conservatory, and she has just now "powered up" again because now there are living people in the house? How long did she sit inactive before now? Simple answer: she's a ghost. It used to be you could assume almost anything, like she came in with the other retirees—maybe very recently, and that's why she can fix their problem. 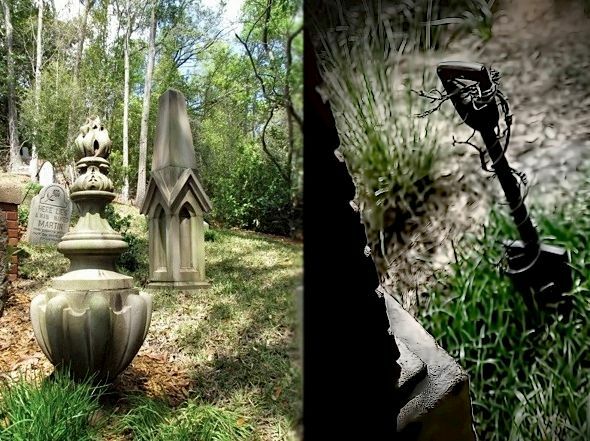 But now she's got a grave (WDW), so we can assume some contact with the place while alive, probably as a relative. Where is that real-life organ tomb? Google is not being a helpful spirit. LOVE the comparison between PLQ and the loudmouthed spoiler guy in the movies! It also reminds me of the parents who keep saying, "it's just a movie, it's just a movie" to kids who are getting scared. If you're not mature enough to enter into the spirit of something creepy, then I'm sorry, but you're not mature enough to be experiencing it. Sorry, I don't know where that organ tomb is either. Your comment is spot-on. There is a social function for scary movies and spookhouse dark rides that justifies their existence: a rite-of-passage, a coming-of-age milestone in learning to face fear of death and the unknown. Little kids admire and envy older siblings and friends who are brave enough to go on "The Haunted Castle" (or whatevv) and look forward to the day when they can gin up enough courage to go on it themselves. When the day finally comes and you (gulp) take the plunge, you feel proud afterwards. That's why people often look back on the ol' spookhouse with affection: it's the site of a past victory. Scary movies serve the same function. That's why it's too bad when a parent drags their kid into such places prematurely. They need to come up with the strength on their own, with only non-coercive encouragement. That's one criticism of PLQ: it tricks kids into going on the ride, and it misinforms their parents. Spookhouses are supposed to advertise that they are horrifying places, and exaggerate this quality, the louder the better. Look at classic HM posters: "In horrifying sight and sound." I guess the PLQ HM represents another type of childhood rite-of-passage now: even Mickey is going to let you down sooner or later, kid. At WDW and TDL, you have ghosts in the library climbing ladders and pulling books off the shelf. At TDL, some are reading books. No indication of unhappy ghosts there. Two seconds later, you encounter an invisible ghost sitting on a stool, playing the piano. Do you have an explanation for the moving and floating objects that aren't part of the fabric of the building? As you know, the GH's Conservatory and COD lines were never at the WDW HM and were removed from the DL HM. May not make a difference, but it's a fact. The Corridor of Doors is the only scene that gives any evidence of ghosts being stuck. Some ghosts are behind the doors, and others are apparently in the hallway moving the knockers. Why are they stuck behind the doors? Maybe they broke the house rules and are being punished. WDW's last door had a pair of corpse hands hands prying it open (and TDL still has this). Marc Davis had a piece of concept art with a corpse's arm bursting through a door. The ghosts pounding on the doors from the inside of the rooms could be like the guy in the coffin. Corpses occupied by just-awakened ghosts who haven't figured out how to separate from their former bodies (or haven't realized they're dead). Leota's lines are "awaken the spirits" and "call in the spirits," not "free the spirits." It's true, the ghosts can't materialize without Leota during your tour. 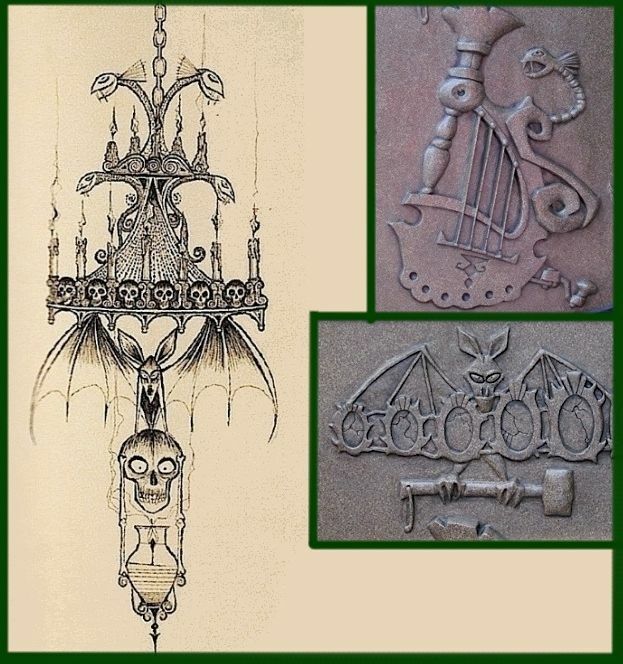 As you said a few posts up, Leota lived in the mansion as a mortal. So why wouldn't she have conjured visible ghosts in life? "She has a remarkable head for materializing the disembodied." Her old spell-book is sitting there in the room, on the page for "Bringing to your eyes and ears one who is bound in limbo." AKA: Making a ghost appear. So you're telling me she's never done this before? Saying "special pleading=fail" to anything I bring up that contradicts your theory doesn't make much sense to me. Not everything has a simple and tidy explanation. The fact that Madame Leota's crystal ball and book of magic are sitting out in a seance circle suggests that she is also newly dead. I guess that since she was apparently 'magical' in her human form, she is exempt from being formless prior to her own incantations. My mind is full of unformed ideas about the nature of the departure of the Mansion's most recent living habitants. Might've been very frightening stuff. Hi HBG2! I'm a dedicated reader. Check every day! I love your insight and critique, and I have never found myself against your claims. This is no exception. I have been through the queue and was flabbergasted as to how awful the whole ordeal was. 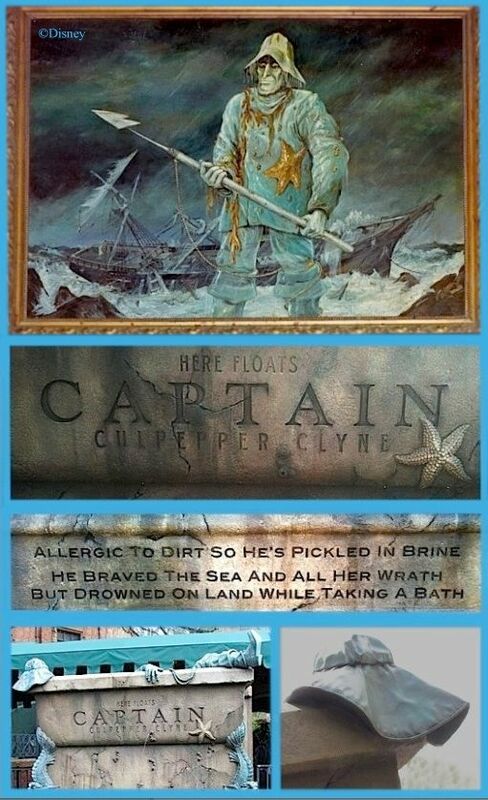 Admittedly, Captain Clyne's grave is very cool and clever down to the epitaph, but I agree wholeheartedly that it has no place in the real world the Imagineers of old were trying to convey, let alone altering an existing character's storyline. I could go on and on airing my grievances, but this isn't Festivus. However, I was wondering, do you ever get any contact from Disney insiders or Imagineers about this blog and your justified opinions? Your sincere appreciation for continuity and remaining true to the ride is something they really need, and your points shouldn't remain something between you and your readers. This stuff is important and should be to WDI. I'd also love to know how you KNOW that Carsillo was referencing the Story and Song, etc.... Please spill! Hi Reed, and thanks for the complements. As a matter of fact, yes, WDI reads this blog (and most other Disney sites). Some of the Imagineers involved in the queue project actually interacted with HM bloggers and HM fans on chatboards well into April, but they've pulled back now, probably because the project has turned out to be controversial, and WDI doesn't want its Imagineers to get themselves mired in all that. Also, bloggers, posters, and others who would like to work at WDI some day have been advised to stay away from these debates too, because it could possible hurt their future job prospects. I've had Imagineers tell me privately that I'm dead right about PLQ, if that's what you want to know. They won't post any comments here. I'm thinking that most readers are getting a little weary of the running debate in this Comments section, which almost seems to be displacing comments on the actual post. This will be my final rejoinder, then I hope the debate will remain closed for now. Anon, there are two issues being confused here. FIRST is my theory about the building being possessed and Leota freeing the spirits from it, all tied into a sort of master narrative. I'm not wedded to that theory, and it's open to modification. Maybe some ghosts are in the fabric, while others are wandering the halls, while others are here for the retirement thing voluntarily. Maybe some of them are satisfied enough with the status quo while others find it intolerable. But they all are finding it impossible to materialize and Leota's gonna fix. Details can vary. SECOND, I'm adamant that whatever is going on with the first issue, none of what you're witnessing has happened before. This is the first time they've materialized like this. Again, the "old caretaker" is a stock character. He comes in two varieties: the creepy and/or grumpy kind, who is part of the problem (whatever it is). The other is the nice-guy one, who is always a simple, observant old fellow who knows all about the place and is utterly without guile. Frequently this kind is "the gardener." His purpose in mysteries and detective stories is simple: he gives the sleuth and the readers a fully trustworthy point of reference. He's the simple guy who always tells the simple truth, without ulterior motive. The "old caretaker" saw something critically important and his testimony you can take to the bank. That's a well-known stock character. If you want me to believe that the Imagineers dragged in this stock character and put him right in our faces but somehow wanted us NOT to take his testimony at face value, then you've got one helluva burden of proof to carry. "Special pleading" is asking for an exception to the rule without giving adequate reason why the exception should be granted. If someone wants us to make an exception to the usual reading of "the old caretaker" in this case ("maybe he isn't right this time"), they need something close to absolute proof that the Imagineers intended us to read him that way, because it's counter to the normal way of reading this stock character. Speculations about what Leota's spellbook may or may not imply, etc., don't cut it. Maybe she just re-discovered the book in a trunk yesterday afternoon. Maybe she just plain didn't want to do any of this until now. Who knows? The "old caretaker's" expression could not be plainer: he's never seen anything like this before. That means precisely this: nothing like this has been seen around here within living memory. And the ballroom makes it clear that when the spirits materialize they go in and out of the building, so there is no warrant for the suggestion that he knows all about the outside, but ghostly shindigs could have been taking place inside without his knowledge. If you can't get past that hurdle first, then in my opinion the rest is a waste of time. "Where is that real-life organ tomb? Google is not being a helpful spirit." It's located at Hampstead Cemetery in London. 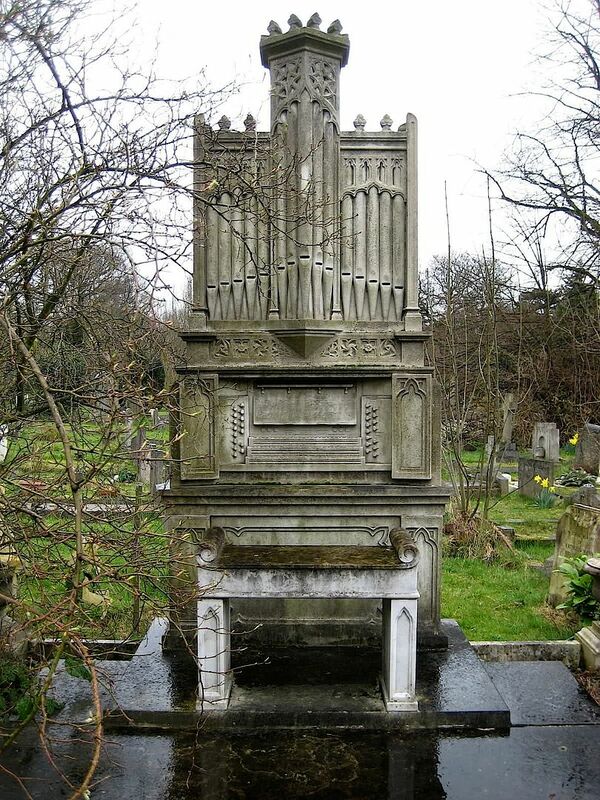 Scroll down toward the bottom of the page and you'll see it titled "Church Organ Tombstone". Yet another great blog. While I had heard all of these arguments before, it is nice to see them all put together in such a coherent form. Even if people(esp. WDI)disagree, it still gives a lot to think about. I'm glad you clarified your "trapped ghost" idea. It is a brilliant concept, even if I don't subscribe to it. 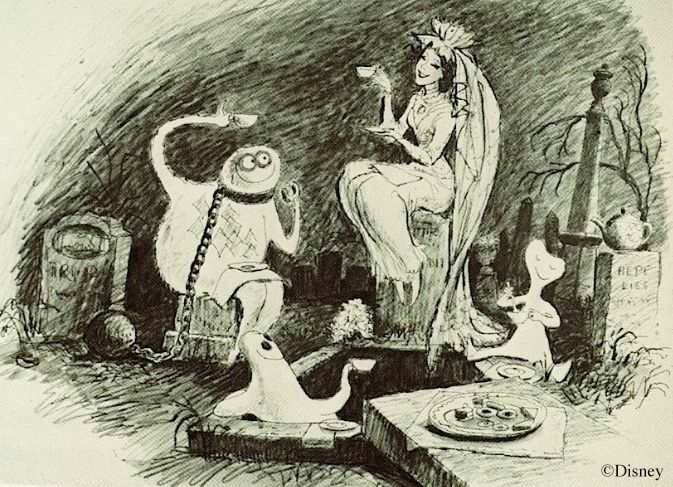 I'd even allow for a few ghostly manifestations (perhaps the original ghosts of the mansion) One might assume that a living Leota conjured up spirits ALL the time. I feel Ocam is still on my side here. However, what has NEVER happened before is a mass manifestation of ghosts before. This is the first time all of them could get their groove on. The caretaker might have seen a ghostly couple while making the rounds and even cursed the spooks that keep hiding his spade. BUT, this is the FIRST SWINGING WAKE he's ever seen. One of the things that makes this such a great ride is the broad range of emotions it conjures, which is why I think it has such a dedicated fan base, even if we are divided on the new queue. Thanks, RequiesCat! I should have guessed Hampstead or Highgate - lots of creative sculpture in both! HBG2 said: "...the gravestones that used to look like real gravestones over real graves, and which incidentally also happened to have quiet tributes on them to X. Atencio and Marc Davis, are now no longer gravestones at all but tributes only." 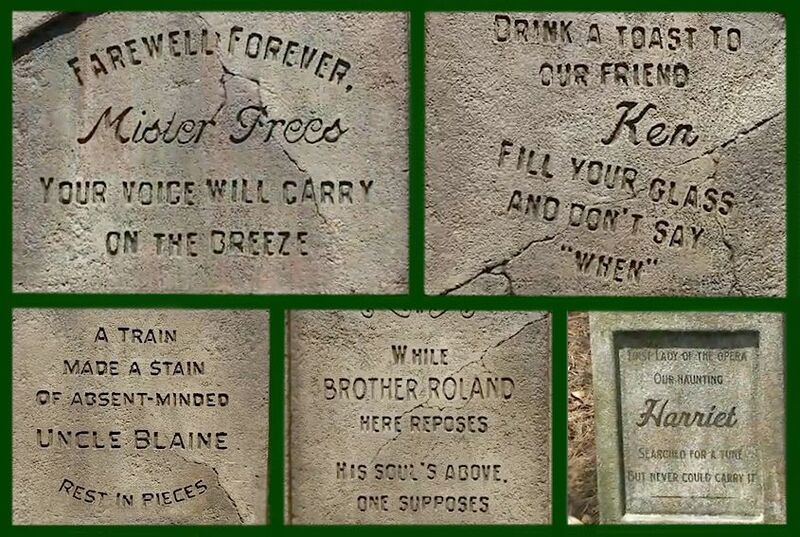 There are problems with reading these graves like that. For one thing, the ground level between the headstones in the planter and the pavement is pretty dramatic. What, did they excavate that much dirt from the old family graveyard when they built these walkways? And again, this is a private plot, on the house's property. The kind of unceremonious junk that public cemeteries are willing to do with old graves, for pragmatic reasons, you wouldn't expect to see here. You go through PLQ, and it's very clear that "tribute!" is sufficient explanation and justification for just about anything. "The GH says both of those things, but they can't both be completely true." Here's how I've always taken it... These ARE 999 happy haunts. They are all happilly retired in the haunted mansion... usually. Tonight, though, YOU are there. You with your sympathetic vibrations. They really want to come out and socialize with you, and so are frustrated, for the moment, that they are having trouble getting through. I don't see any discrepency in the two statements. Just because a spirit is generally happy doesn't mean it can't have moments of frustration. True. They finally gave tribute to Thurl Ravenscroft, but in a rather inappropriate way by putting his name on the organ of the "Composer's" crypt. Clearly, that *should* be a tribute to Buddy Baker who wrote the music and scored the attraction. To be even more specific, it really should be a tribute to both Buddy Baker and Gaylord Carter, whose name should be on the organ. A more logical tribute to Thurl would be to add a raven to the pet cemetery, and call it "Ravenscroft" using a similar, Campbell-style sculpture. 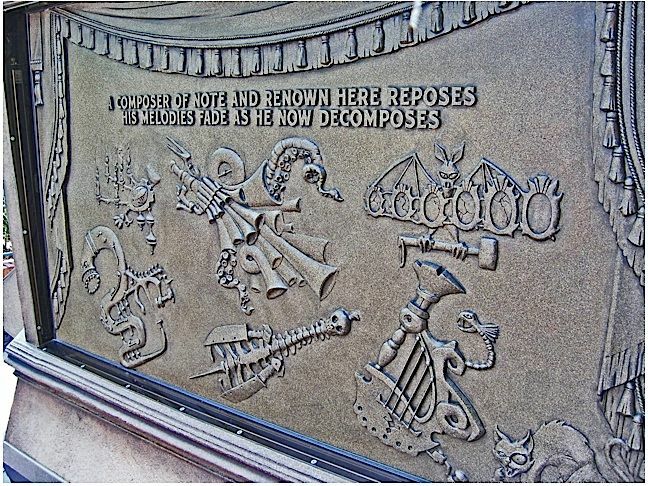 They should also have added the one-eyed black cat there as well, since it has absolutely nothing to do with music and shouldn't be on the Composer's crypt. I think they were simply grasping for *something* to put on the other side of the crypt, and so concocted the M.O.W. style instruments to put on that side. It was probably the only nod to the M.O.W. that they were allowed to have by the "higher ups". Hey there Brodie. One problem I have with that read is that they pay no attention to you whatsoever when they come out, other than the popups and, at the very end, the hitchhikers. I think they want to materialize, period. The point about the two statements is that they can't both be taken together at face value. Further explanation is required, such as you supply (Well, they're usually happy; but tonight, not so much), So you can't rely on the GH to give you the simple truth with everything he says. What you see with your own eyes is that in this case, his "happy" does indeed require some nuance. Who knows how much more nuance it might need? Suddenly we're unsure exactly how "happy" they are. I made the point in the One-Eyed Black Cat post that the GH is very deliberately presented as morally ambiguous. Good guy? Bad guy? Truthful? Liar? You don't know, and you're not supposed to be able to know (at least until much later). "I made the point in the One-Eyed Black Cat post that the GH is very deliberately presented as morally ambiguous. Good guy? Bad guy? Truthful? Liar? You don't know, and you're not supposed to be able to know (at least until much later)." I absolutely agree with that. My take on the corridor is one of those things that I think should only be clear in the second viewing. The first time through, you should certainly be worried about those things on the other side of the door. And the Ghost Host is definitely somewhat unreliable, and clearly lying at times. "I didn't mean to frighten you prematurely," for example. So he says, but you can tell by the tone of his voice that, whether he meant to or not, he certainly enjoyed it. I bow to you, Dan. You hit the (coffin) nail right on the head -- on ALL counts. I've said it before and I'll say it again, TDO should be ashamed of themselves for what they did to a classic attraction. They have, indeed, RUINED it. In my opinion, whoever concocted and greenlighted The McMansionland Playground is incompetent and unqualified to hold such a position of authority. The only thing missing from this eyesore and atrocity is a glass crypt with Walt's coffin spinning inside it. I agree dead on. There is a reason why spookhouses have a castle or an old house as a facade. It evokes locations seen in old late night horror movies. This is why we don't see gingerbread houses or candy factory ghost trains. 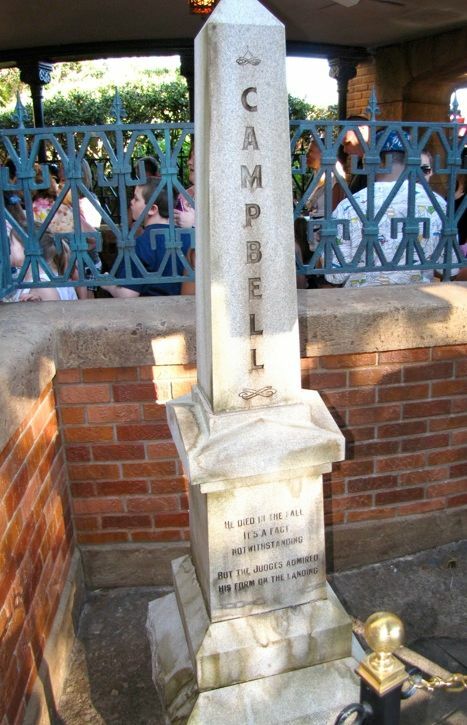 If you see the caretaker as being in the past (as I do), working in the graveyard next to the mansion in its former location before it was moved to Disneyland and fixed up... he witnessed this event a long time ago. Then he probably quit his job and never looked back. Who knows if living people were occupying the house during that time or afterward (such as Leota or the composer), before it was discovered by Walt and co.
"It was built around 1800 in the swampy bayous of New Orleans, and was moved here intact because it was such a fine example of early architecture from that section of our country. It had not been occupied for some time and was badly in need of repair, so we started the work of restoration as soon as it arrived at Disneyland..."
As you've said before, Anderson was the "father of The Haunted Mansion." Many of his ideas didn't make it very far past the drawing board, but so many did. Since you and I perceive the attraction differently, there are bound to be things that make sense in my perspective and not in yours, and vice versa. *You see the HM experience as taking place in modern day New Orleans, Louisiana. The caretaker currently works in the large public graveyard behind the mansion, which you're unable to see because the view is blocked. The mansion wasn't relocated anywhere, and the graveyard jamboree happens "tonight." The reason the mansion first appears pristine and then looks run-down is because the ghosts were imprisoned, keeping it preserved until they were freed by Leota. This is the first time any of the ghosts have ever been seen by humans. 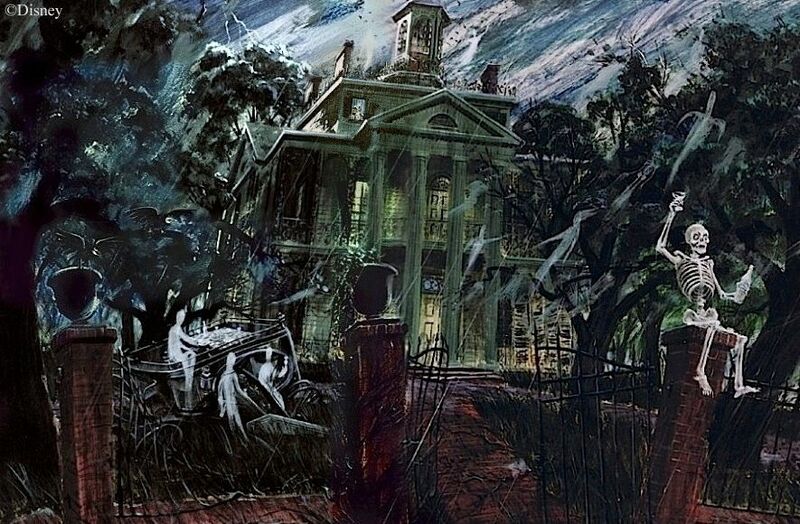 The attraction's story takes place on a dark and stormy night, so it doesn't matter if you enter the mansion during the day when it's sunny out. The gate plaques and servants are to be ignored, as "the haunted mansion" is just a nickname for the place and the house has been abandoned for many years by the living. The Doom Buggies, like the servants and gate plaques, are to be ignored. This perspective has a lot in common with how the HM is presented on the Story and Song album. 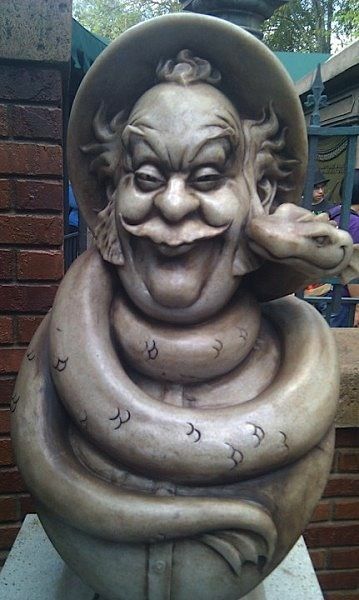 *I see the HM experience as taking place in Disneyland, California - in a recreation of New Orleans on a smaller scale. The mansion was moved here from somewhere else, and there's no graveyard behind it. 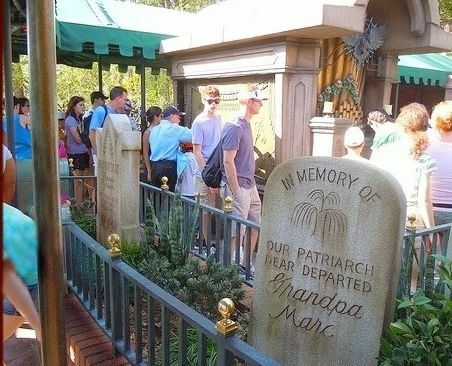 They couldn't move a public cemetery to Disneyland. The mansion looks neat and pristine because that's how Walt wanted everything in his park to look. The sign inside of the hearse (which is part of the queue and therefore the attraction) flat out tells you you're in Disneyland, and that they have a Ghost Relations Department. You get a glimpse of the mansion's former interior when you see the GH's corpse hanging from the rafters. When you board your Doom Buggy and drift into the black void, you enter the spirit world and see the mansion as it once was, broken windows and all. It doesn't matter what time of the day you entered the mansion, because you're now immersed in the dream-like world of the spirits, where it's perpetually 13 o'clock in an endless night. It's a bit like astral travel, if you've heard of that. Not enough information is given to know the (super)natural laws governing the ghosts, such as why they need Leota's help to become visible to mortals. Since they exist on a different wavelength than humans (and can "see" each other just fine), there's no need to be "visible" (to humans) very often. The mansion is first and foremost a "country club" for ghosts (where they can lounge around, play games, practice their scare tactics, etc.) and when humans come in they have someone to scare... and a reason to be seen by limited mortal eyes. Like a radio, the reception improves, and finally you're able to see the ghosts. They're currently having a "swinging wake," and you see for yourself how much fun they have at this place. One ghost follows you back to the living world, where he will haunt you until you return. The gate plaques are part of the experience, as The Haunted Mansion is the actual name of this ghostly retirement home. The GH welcomes you to "THE Haunted Mansion," not "this haunted mansion" or "my haunted mansion." At WDW, he refers to it as "The Haunted Mansion" twice. It's like the White House (not just a white house, but THE White House). As for the servants, I just assume they're people hired by Disney to ensure the safety of guests to the mansion. The Doom Buggies are supernatural carriages designated for the official Haunted Mansion tour, with the GH as the knowledgable tour guide. There may even be several different ghosts who are hosts - and today you get the guy with the booming voice that hanged himself. As you know, I'm not a fan of PLQ. Stylistically it's out of place and it ruins the foreboding atmosphere. The HM is supposed to be scary with touches of light-heartedness in the beginning, and light-hearted but still somewhat scary by the end. In my opinion, we're not given enough information to say without doubt that the ghosts have never been seen before. That's my only REAL disagreement with you over PLQ. Aside from the fact that I see the graveyard as being real (the ghosts brought their tombs with them when they came to the Mansion and "planted" them behind the house). Mike, I have too much respect for you to begrudge you the space to lay out your views. They're always interesting, and you are an extremely keen observer. It was you who first noticed the Mariner contradiction, for example (hat tip, ever'body). There's no need for point-by-point debate. The main difference is simple: I want to stay as close as possible to what the Imagineers intended for ordinary guests to actually get. I'm not going to presuppose the whole Andersonian house transport scenario or other things no one could be expected to know without research. I could be wrong, but I doubt that many guests see the caretaker as a character from the past, for example, and I don't think he is presented that way. (It would have been SO easy to do something with his costuming that unambiguously shouted "19th century!" to make sure folks picked up on that.) I screen out a lot, but people are very skilled and sophisticated when it comes to screening out the "noise" of a presentation (safety bars and signs, etc. ), so there's no need for me to justify the amount that I include there. I think most folks assume (correctly, says I) that they're supposed to imagine themselves in New Orleans. The adjustment to present day is a little leap they make without a second thought. I think many, if not most guests are quite capable of ignoring even the doombuggies as something "outside" this imaginative presentation of a haunted house, for example, and I think they do so. I will concede one small point. They're having "trouble" getting through. It's not impossible that some of them have had some success in the past, with difficulty, so yes, I can see some measure of visual ghostly manifestation along with the poltergeist stuff. The caretaker likely knows that the place has a reputation for being haunted and may even have seen an odd thing or two. But if so, it's peanuts. There's never been anything to compare to the blowout we're seeing. This is truly unique. I very much like the idea that you are a key player in the story: your sympathetic vibrations were the key that at last opened the door. 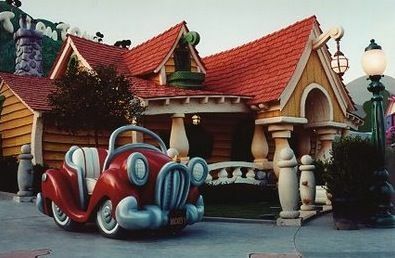 While I know that the current Imagineers had good intentions, I wonder if Pepe Le Queue's blatant rehashing of and heavy reliance upon Museum of the Weird concepts reflects an appreciation of early, albeit unused Imagineer art or if it simply betrays a general lack of originality and understanding. I took 'em out. I"ve only spotted two direct "quotations" from extant MoW artwork, and I've put them side-by-side in the post. There may be others, from artwork I haven't seen, but I think most or all of the rest is Carsillo and Company trying to imitate Rolly's MoW style. I've changed my mind, and I think I'll do a post on the Museum next, to lighten the mood, before reviewing the new HHG's. That will also give a little more time for further shoes to drop, since I'm pretty sure the Carsillo team isn't finished yet. Either way, the question remains essentially the same. To rephrase, is the imitation of Crump's style applied deliberately in tribute or for lack of the ability to devise anything better? 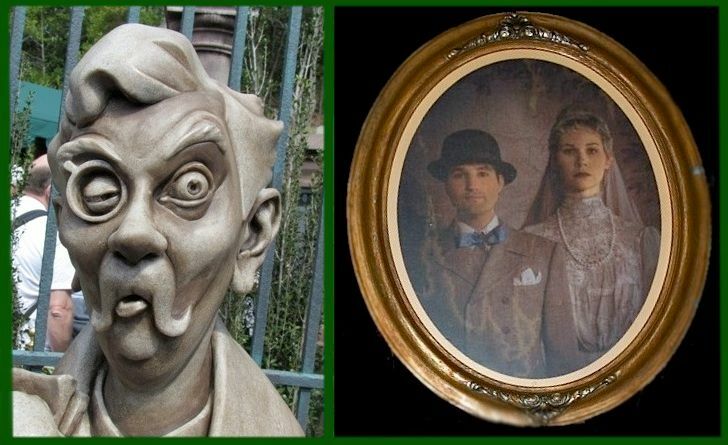 By the way, The Dread Family busts look more in the style of Mr. Toads Wild Ride. The busts are like a combination of Mr. Toad characters and missed-the-entire-point-of-why-they're-exaggerated Blaine Gibson faces. THG, there is no question of Carsillo's sincerity. I'm sure those are genuine bouquets thrown to Rolly. And frankly, there are a few of them that don't miss by too much, if only they were in a suitable environment. Same with the Dreads. I think a few of them (Maude, for example) wander into the outer reaches of authentically HM style. As others have noted, her portrait sitting by the hitchhikers wouldn't be out of place as a Sinister 11 addition, and her bust isn't any goofier than Aunt Lucretia. But taken on the whole, the Dread set would only work if they were behind a misty scrim, 20 feet away. Fabulous post and fabulous comments! On the storyline, my preference is that the house is haunted in more poltergeistish fashion until after Leota, when all those invisible hands and disembodied shadows suddenly materialize. I do agree that it's a special event made possible by Leota's chant and your sympathetic vibrations that very day, but I'm not sure that they're all angry and trapped all the time. I'm not even sure the CoD ones are: they might just being trying to scare you like good poltergeists. I haven't seen it in person and it is unlikely that I ever will, since I have no particular desire to visit WDW (I'd much rather use the same money for another trip to Disneylands USA, Paris or Tokyo). But your review does sum up much of how I feel about the pictures and, incidentally, the pet cemetery at DL. They're just too darn cartoony! I don't mind Disney being self-referential, but where narrative is important, there is a way of being self-referential that isn't cartoony and doesn't detract from the aesthetic or the experience. I don't mind that the organ makes music, but it would have looked a lot better if it mirrored that actual grave you showed. I don't mind Pock's Projection Poetry, but the rest of the tomb is fugly and ridiculous. About the least offensive one, to me, is the Mariner's. 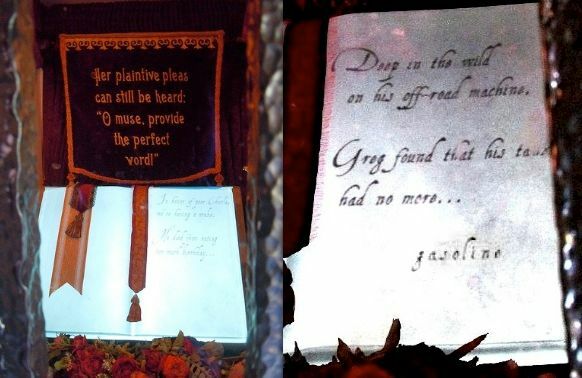 I don't necessarily care for the tale of his passing, given that he's probably my favorite HM character after the HHG (I actually think he would have made a much better and more interesting basis for Davy Jones in the PotC films) but at least his is just a slightly more exagerated version of a tomb I could see existing in real life. The others are nonsense. 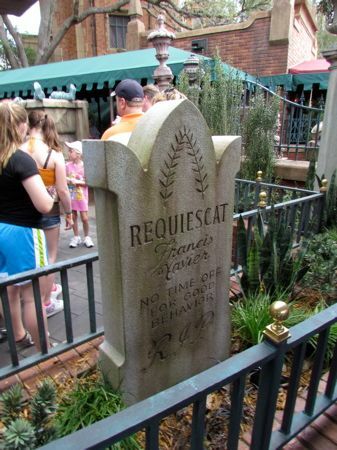 I don't mind graves for the characters in the ride either, so long as they look like graves. I'm glad the other Imagineers have tributes now, only I wish they all had space and that poor Marc and Xavier weren't buried standing up. The pet cemetery at DL is a cute idea, but the graves look too much like they're from a Tim Burton movie, which doesn't fit for the HM. And that's really it: it just doesn't fit. Because it doesn't fit, it pulls me out of an experience that is already so tenuous to grasp at a Disney park anyways. Overall it reminds me of the comparison in treehouses made by the DisneyLies site: the Swiss Family Treehouse looks like it would if the Robinsons had just stepped out for a minute, while the Tarzan's Treehouse looks like it would if it were an attraction at Disneyland. Thanks, Cory. For me, the tribute thing is easy: they're fine if they're subtly attached to something that would have been there anyway. You should never say, "Why is that there? Oh, I see. It's a tribute." Same with self-referentiality. It should never be the narrative, just a ghostly companion to it. It should be something easily missed, like a pun found within a perfectly sensible story. That's true. On the other hand, you don't have to be a chef to know that something tastes bad. Sorry, but to me that sounds like the argument of a person who doesn't have an argument. The problems for me are three areas already touched upon; it acts as a spoiler regardless of how incorrect it is, it limits the believability and therefore the imaginative “reality of what if” as you enter the foyer, and it sets the tone for the way you and your fellow guest are expected to act and react during the rest of the experience. As HBG2 eluded to then, why is this part of the queue, really why was it built there? The line moves no faster, you may argue slower in fact. As far as the option to choose, the reports I’ve heard and the few times I’ve been there later in the evening the choice is non existent. Either truly done as a tribute to the fans or a promotional gimmick, likely a hybrid of both, it just doesn’t fit here. WDI thanks for trying, a fantastic job, anywhere else it would have been well done. Much better than the Pooh Queue really. Moved to an exit attraction as MotW, now there’s a tribute we could all celebrate. Speaking of tribute decadence, I went to the WDW Destination D and a few Imagineers went through all of the tributes in the new Mickey Mouse meet & greet queue. Once again, they pulled from all sorts of Disney films relating to magic that had nothing to do with the specific era that the queue is supposed to take place in ie turn of the 20th century. And now there is even a Leota reference in the new Star Tours. It is one thing to reference say Horizons at Space Mountain because they fit the same timeline. But to just grab any Disney reference and shoehorn it in anywhere is going way overboard. wood. But of course they wouldn't do that because those characters have a higher profile than the ones from Wind in the Willows. 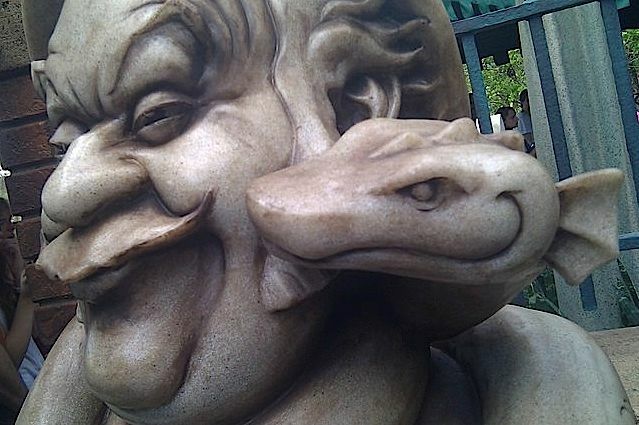 It also seems strange to do this since Mr. Toad still is very much alive at Disneyland. Been reading your blog for a long time, and I must say, you hit the nail on the head with this one. The thing that concerns me most about these changes to the Mansion is that it really blows open the way Disney sees their popular rides/films etc. in general. When they find out that something they created is really popular, the first thing they end up doing is parade it around, pronounce its glory to the world, make it seem like a sort of 'God on earth'. It really bugs me, and now, seeing as the Mansion has fallen victim to this new Disney, it's just plain sad. "b. Ghosts from all over the world came to "retire" at the mansion because it's a happenin' place. Usually they're invisible to humans. Today's your lucky day - you get to see some." For once, I have to say that I personally agree with this. This has ALWAYS been the vibe I got from the ride- my intuitive one. 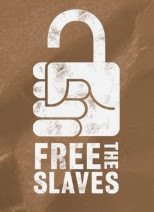 Thinking of them as trapped is something I had to think hard about. To me it's like, "Darn it, if only these mortals could SEE us for once!" I mean, if you think of the retirement home set-up as Walt's doing, it's kind of mean of him to have them be trapped behind doors and walls. I have no idea why nobody likes the early promotional material anymore. Didn't WALT like the idea? Also, I've always felt that the ghosts banging on the doors were the only angry ones in the house. I've always felt that the happy ghosts are always the happy ones... The Ghost Host's laughter has always struck me as being macabre glee, like Gomez Addams getting his thumbs screwed and enjoying it. ...Or at the very least, they're frustrated that they can't move as easily as they'd like. To me, it's not as though they're literally imprisoned in the brick and mortar, but that they're not, as of yet, on OUR side of the veil. Sure, they're manifesting themselves in faces in the architecture, but that doesn't mean that's all they can do. Why make the Ghost Host a villain? These are conclusions that I came to very early on in my exploration of the Haunted Mansion- instinctive ones. Do Imagineers not want to appeal to instinct rather than intellectual musing? I honestly think some of us are thinking about it a bit too hard. I agree with Kreepy K entirely, and also Anonymous's perspective on the nature of the Mansion. Actually, I've been more frequently interpreting him as the sort who SUSPECTS that he's working at a haunted house, but hasn't been sure until that moment when you pass by him. But again, I don't know how much of a difference it makes. It's usually the artists who have the better idea than the executives, but in this case it's different... somehow, they got lost in making "clever" allusions when in fact they should've served the most important function in a Disney attraction: tell a story. They could've solidified backstories for the Mansion's characters, which isn't something I mind at all, honestly, but they forgot where some the ghosts came from and how they would've related to the Gracey family, if at all. I don't think the ghosts at the beginning of the ride are angry. Ghosts LOVE to scare people. It's what they LIVE for. It makes them happy. The whole premise of ghosts retiring to the HM, is that they will have an unlimited supply of "live ones" who want to see ghosts and that they can scare the bejezus out of. 1. It is a place for people to see ghosts. 2. It is a place for ghosts to get the chance to scare people. Location where ghosts and people can interact. Maids/butlers to direct you where to go. An actual "Ghosthost" to serve as tour guide. A ride vehicle to help you get around. It is kinda like the Kilimanjaro Safari at Animal Kingdom except instead of seeing live animals you see dead people. Just like that ride, (and most rides in the parks) it is always experienced as a "first time occurrence." So going back to Dan's point. The queue makes references to events that have NEVER happened. It is one big tribute to the ride itself not an addition to the storyline. In relation to the story, it would be like seeing a trailer at the movies. Thing is, the HM is not supposed to be like a movie. It is a unique experience happening in the present. These spoilers and references only serve to screw up the premise of "take a tour of a haunted mansion with real ghosts" and make it just an amusement park spookhouse with fake ghosts. @J. McMahan- I guess you're right about them not being angry. I guess I overemphasized the animalistic snarling you hear... But it is true that some are unhappy (at least for the time being)- I mainly think of Thurl going "Let me out of here! Where is everybody? Who turned out all the lights?" As far as can be determined, this poor guy is lost and doesn't know he's a ghost. So I suppose you can infer that at least SOME of the ghosts who reside there are surprised to find themselves "disembodied". Given that ghosts traditionally can walk through walls, the ghosts in the Corridor of Doors are either making noise deliberately in order to frighten visitors, have yet to realize that they can escape material barriers, or the house itself is a paranormal entity that is restraining them. I think this queue is going to go down in history as one of the worst, dumbest and most wasteful things that Disney has ever done to one of their park attractions. For me, it's very telling, and not in a good way. I love the Kilimanjaro Safari analogy! When I mentioned that I find suspension of disbelief so hard to grasp in Disneyland anyways, one of the things I always had a problem with was the Doombuggies. Why would an old plantation house have an omnimover system?! THat analogy tidys things up nicely. That said, what I don't like about it is that I like to side with imagining that I'm in the location intended by the land... So while I'm aware that I'm in Disneyland (how could I not be?) I'm also imagining that I'm in New Orleans. If I do conceive of the HM as a retirement home in Disneyland, then it pulls me in that same direction as Tarzan's Treehouse vs. The Swiss Family Treehouse. Back to the stumbling block. Stock character: Old caretaker (good guy variety). Simple, sincere, knows the place well, utterly trustworthy. In this case, he's never seen anything like this before. Translation: Nothing quite like this has ever happened before in living memory. You can't weasel out of that by subverting the stereotype without good evidence. You can fill in the other blanks any way that works, but I think you're stuck with that part of it. What proves he's never seen the ghosts before, at the end of the day? He might just be a cowardly type of fellow, whose gag is that after so many years of bumping into the ghosts every night is still scared of them. That's the interpretations of the SLG comics. Maybe so, but it's still stupid and wrong. I've said elsewhere, so I may as well say it here: I think PLQ will generally be regarded as boring within a year. Please don't say "You can't weasel out of that." I'm not trying to make any excuses for my own benefit. Not only that, I find that phrase offensive. If I can easily interpret the caretaker as the even simpler archetype- the scaredy-cat- then I can compare him to Shaggy. I'm not even partial to either explanation- so it's not as if I'm trying to defend a position. Very well then, pick your own phrase for evasion. He's called "the Caretaker" on all the blueprints, so we know that's the explicit intention of the Imagineers, and indeed that's how people overwhelmingly do understand him. Since the "Shaggy" alternative you describe is not a part of that stock character, it remains your private fantasy, a fantasy which in this case opens a door to a potentially false understanding of the entire show, so yes it does matter, contrary to your suggestion. That reading also makes no sense on its own terms. If he's so horribly frightened by the ghosts (and he is—look at those knees), and they do this from time to time, he would have quit long ago. The Caretaker tableau is fairly easy to read even if one doesn't know his official name. 1. He's carrying a shovel. 2. He's carrying a lantern. How can you tell that things are not business as usual? 1. His mouth is agape. 2. His eyes are open wide. 3. His hair has possibly turned white with fright. 4. His knees are knocking together. 5. He is frozen in one spot. He stands outside the cemetery gates and is not going in. Presumably he would have locked up at dusk. But they are now unlocked. Bad sign. Why would he carry a lantern and not a flashlight if he is supposed to be modern? You try filling in a grave at night while holding a flashlight and see how far you get. Reading more into his title. A caretaker lives on property. In the scene, he is accompanied by a little dog. You can easily imagine that the caretaker was sleeping and was woke-up by his dog. "What is it boy? You hear something?" Then he looks out his window. Maybe he sees a weird light or hears music. "Damn kids must have climbed over the fence. I'll show 'em what for!" Either way, they decide to go check it out. When we find him, we see him at the point where he's discovered ghosts; near the place he lives and where he works everyday. If we could stay and watch the next scene, it would probably be him running away, if he can get his legs working again. But by then we've already moved on. Yes. I've heard people try to make something out of the kerosene lamp (i.e. he's a figure from out of the past), but I think that's a pretty thin reed. Ain't no 'lectricity 'round here, friend, and them ol' lamps, they still work jes' fine. An excellent post, and I'm enjoying the talk-back just as much, but there is a glaring omission in your review of the new queue that I was hoping to hear from you on, which is the violation of the taboo against referencing children in the mansion (the newly added grave of the twins)... your thoughts? The busts of the Dread twins (what's-her-name and what's-his-name; they're frankly not worth the bother of looking up) are indeed the first dead children in the HM evah. Some Mansion fans think this is disgusting, a violation of a long-standing taboo, and further evidence that Carsillo is incompetent. I agree that he doesn't know what he's doing and probably didn't even realize he was crossing a boundary, but it's hard for me to get too worked up about this one. One way you can get away with kid murders is to make the brats utterly nasty, displaying such an adult level of viciousness and rottenness that you have no qualms about "trying them as an adult," so to speak. That's what this is. Those are two mean little boogers. True, nothing like this has ever been done here, but somehow I don't feel like it takes the HM to an utterly different moral plane. But like I said, there are others who see it differently and are offended, so . . . choose your positions. To be fair with the Magician Mickey Meet and Greet's batch of tributes, it definitely feels like they're thinking in the same vein as House of Mouse, which linked pretty much all the worlds of Disney together, including the Mansion, to a vaguely Mouseton inspired town called "Main Street". This was OUR experience. This was OUR story. It was not forced on us; it was not loud or interactive. In fact, the only interactivity was also what makes it most memorable- the relationship my grandfather and I had as we were changed from a shuffling old man and a clumsy, gawky boy into brave explorers of the dark, old house and all the messages and images that come along with that. With this queue, that story, MY story, could not exist. Not only wouldn't my grandfather and I want to stumble through this "cemetery", with bubble-blowing graves and poems about off-roading, on our way to explore the house, but there is no real cemetery that would even look like that. A sense of play is replaced by noise, a sense of mystery has been forced out by a carnival. Sometimes, the best stories are the ones that allow you to fill in the blanks, and the best interactivity is what is set up between two people, not what moves the most, sings the loudest, or chews on its own tail for the amusement of fanboys. Thanks, Matteo, and your comment is a gem. 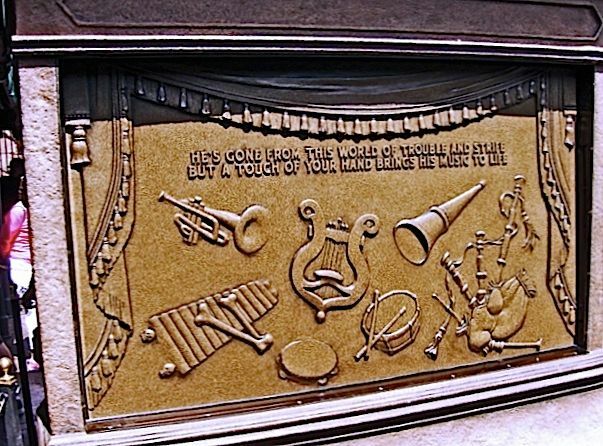 On another review of the queue's contents, the thing that is driving me mad THIS time, is the presence of bones used as xylophone mallets on the side of a crypt. What?! That is a GHOST-SPECIFIC GAG!! Who the heck would put that on a crypt mere days after the deceased had passed? Also, WHOSE CRYPT IS THIS? That's part of the problem with this crypt. In theory, it should be a tribute to Buddy Baker, who was the "Composer" of "Grim, Grinning, Ghosts". Instead, they added a tribute to Thurl Ravenscroft on the organ end of the crypt, who had nothing to do with the organ or composing the music. It now implies that the organist inside the Mansion is the composer, and that his name is Ravenscroft. So totally wrong on so many levels. I *should* have said: Buddy Baker was the "Composer" of the *music* of "Grim, Grinning, Ghosts". 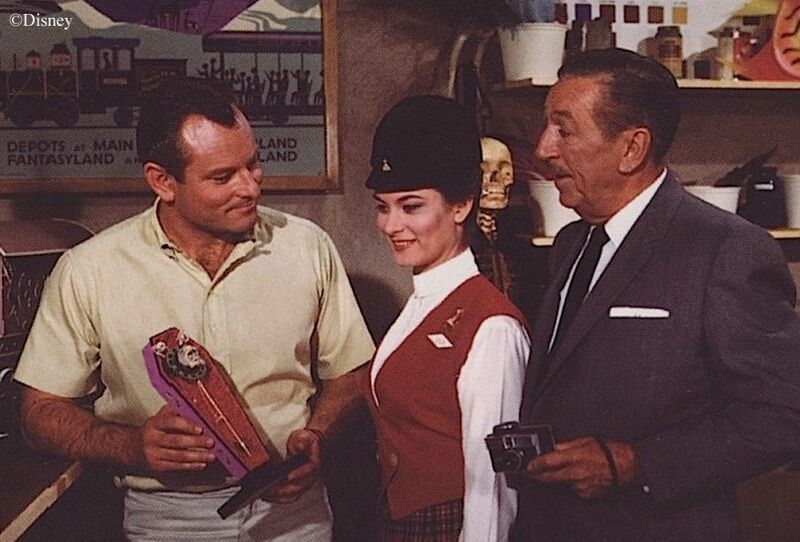 He was also the musical director for the attraction. The lyrics were written by X. Atencio. I've been assuming the organist is buried in that crypt, since the organ on the end is so prominent. That would be anyone's first thought. Think of it as a big refrigerator with tributes stuck all over it like so many refrigerator magnets, with no more thought to the content of the refrigerator and no more thought to their logical relationship with each other than you would expect to find with any magnet-laden refrigerator. There's a loose theme of "musical instruments of the Haunted Mansion" governing the selection of most of these particular little magnets, but that's it. Ask nothing more. While I do think that the interactive queue for this ride could have been much subtler (and less garish to look at), I don't think it was necessarily a bad addition. It's not meant to be a part of the story, which is one thing I dislike. It has two main purposes, which it fulfills nicely; to make the line shorter, and to keep children busy. But I don't like the fact that it deviates from imagineering tradition by focusing solely on the practical function over the "story". It's not meant to be part of the Mansion's plot, just some bits to keep people occupied. Like a gift shop or a museum, I guess. Which is fine, but a story would have been much more Disney. But it makes the line a lot shorter, and if you chose to go through the extra queue, it's pretty fun. I enjoyed finding all the tributes and playing with the crypts. The problem is, the queue is is supposed to be "part of the story," contrary to your claim. The Dread family lived in the house, and a portrait of one of them is inside the ride. You are free to screen them out and re-label them as harmless, the equivalent of a gift shop, so long as you recognize that the Imagineers did not intend anything that detached. It is actually meant to supplement whatever story exists inside the mansion with an interactive mystery that crowds itself nonsensically into the hitchhiking ghosts tableau. I can't help it. The "music" tomb is really irritating me. The instruments shown on the side seem to suggest that ALL of the musicians in the mansion are buried there. This is unlikely, based on the size of the crypt and variety of historical eras represented by the musicians. Is there a xylophone anywhere in the mansion? I thought the drummer was using those bones to pound on the top stone of a crypt. There's no xylophone, but presumably they think he's using the sarcophagus lid as a sorta kinda makeshift xylophone, based on the shape. When available, the wait is shorter for those choosing to leap frog the PLQ purgatory. If the PLQ is there make the line quicker by distracting children and entertaining adults, the illusion is defeated when other guest bypass this part of the queue. Those same demographics that would normally be in a rush are actually trapped longer, while those who would rather linger and interact a little deeper are hurried. My overall impression remains the same as the one I formed from pictures and video. It’s cramped and poorly laid out – even though there were only six people in it, we managed to become logjammed at every turn. You can’t get far back enough to see anything at a proper distance. The only things anyone seemed impressed with at all were the hillside graveyard, the Campbell obelisk, Master Gracey’s new location, and the Mariner (which wasn’t making noise or spraying water at the time.) The style and mood of the sculpture clashed mightily with the rest of the exterior. I guess it;s possible that it would look OK from a distance, but as I noted, you can;t get more than about two feet away from anything. So, my opinion remains that while the *idea* of some kind of queue addition wasn’t entirely without merit, it was so poorly executed from beginning to end that it does mar the whole. The HHG projections weren’t bad; it seemed like they were a bit slowed down from the videos posted when they debuted, which is good. But the enjoyment derived from them seems more due to novelty than artistic or psychological effect. Six? Is that because everyone was bypassing it or because you were there at a time when very few people were at the HM, like early morning? Was there a line for the ride at all? It was during the parade, so it was definitely low-volume. There was a line, but it was short. Including the time we spent in PLQ, we waited maybe five minutes. 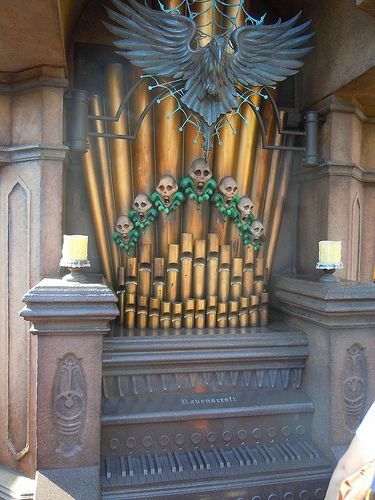 Regarding the xylophone: While there isn't one seen in the attraction, there is one in the Graveyard base music track, most noticeable during one of the changes of key. NO NO NO! What are they DOING? EVERYTHING about this is wrong. It's immature, obnoxious, rude, and gives spoilers. Plus, it makes no sense. This new queue screams, "Hey this great ride is here! Look, we're all silly ghosts! Come laugh at are stupid, idiotic, pointless antics! We don't care about Walt's vision; he's just some long-dead famous guy who's opinion doesn't matter anymore!" The HM is supposed to have a SHOW FLOW, and they've completely ruined it! I am seething with rage! So dissing the Potc fans wasn't enough, huh? They decide to slap Walt himself in the face with this repulsive playland. Barf. Scream. Barf. In re-reading the comments here, your words about the traditions behind funhouse spook rides struck me. Especially their tendency to exaggerate how scary they actually are. I would love to see what you could do with this overall topic if you addressed it in your typically well-researched and thought out manner. I think this is a MAJOR fault in the new queue, and additional evidence against PPLQ is always welcome. It just goes to show, not EVERYTHING has to be recreated to modern tech or pop culture, they've pretty much Poster Boarded Jack Sparrow to POTC (Really guys? You don't have to put the same guy in a million different places just so you an promote your movies, even IF the ride inspired it) Now they've pretty much ruined the flow of the ride with this. Of course, you can easily pass all this by going through the 'Direct Queue' and go through the Ride as it should be. But who's going to do that when you've never been on the ride? the only neat bit i'd let slide that you didn't already agree with is the ring. I'm just happy it's back, so the younger generation can notice the little details that makes disney magical. The ring isn't "back". It was never really there to begin with. It was a metal stanchion that had been cut off. It was merely coincidence that it resembled a diamond ring, and a legend about it being the Bride's engagement ring evolved around it. It was never a planned detail. It's "back" as a piece of the imaginative world of the HM, even if its origin was accidental. My only point in the post was that its magic derived precisely from the fluke, from its unplanned appearance, but if there are fans for whom the new one works, and they get the same tingle, then I have no quarrel with them. In fact, if the entire queue had been done right, remaining within the imaginative world of the HM rather than being so self-referential—making "Isn't this a great show?" part of the show—then the ring would have been an ideal way for the Imagineers to say "We're fans like you" without blowing trumpets about it. It would have been a nice touch in that case, a quiet signal. I, honestly, hate the ring. 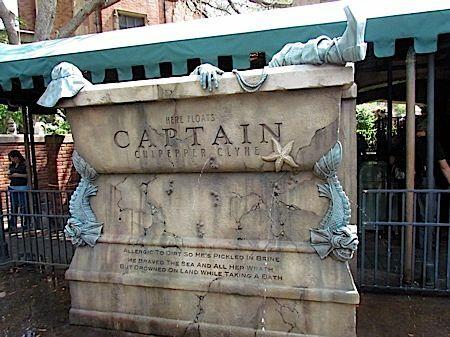 I was born in '97, and have always been fascinated with Disney, primarily the Haunted Mansion and the Pirates of the Carribean (Barker Bird, why did you leave us? Pease come back!!!) 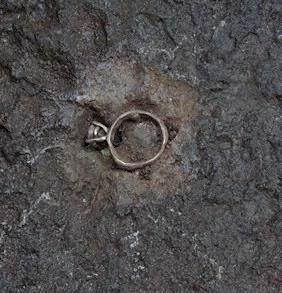 I believe the ring was preposterous folklore, a terriblle, albeit interesting, pipe piece. The Master Gracey story is ridiculous, and I believe it needs to be toned down a little... Actually, A LOT. Another thing that is ridiculous is all of the "next-gen" queue lines. 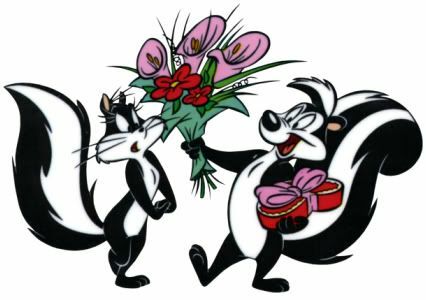 You said it best: they make every queue a Pepe Le Queue. To end my rant, I want to say that I love the old ride, including the queue, is much better than the new ride. I am not being negative, but honest. Most kids don't care about the line. They can use their parents' smartphones and ignore the rest of the world. Inside, every time I have gone since the new queue (5-8 times) someone always says, "Look! Master Gracey Killed Himself!" It ruins the whole atmosphere. Anyway, I love your blog site, thank you so much for it! I remember a CM co-worker had told me that if the 2003 Eddie Murphy film were successful that the HM cast would be changed to real estate agents. Of course, I don't know the sincerity of that rumor. The 2007 rehab was at least decent, even though they reversed the Dorian Gray-esque image in the foyer. I am seriously late to the party I realize but I wanted to express a couple of thoughts. First.. Great blog. Been a HM fan since I was 5 in 1969. Many things you write about bring back memories of things now changed. Second, in support of the "never happened before" theory, I'd like to suggest the placement of the caretaker relative to you, the visitor whose sympathetic vibrations are unleashing all this fun. YOU are part of his v astonishment in my opinion. He's shocked at the scene and is place outside the gate and angled toward you more than toward the obvious focus of his astonishment. YOU have never been there before and THIS has never happened before. "Who are you people and what have you done?" My very late two cents worth. *sigh* I've never been to Disneyland's Haunted Mansion, and WDW's Haunted Mansion has been my favorite at the park for quite sometime...but really? This queue is absolutely ridiculous. In fact, a lot of Walt Disney World rides have been getting a Pepe Le Queue treatment: Dumbo, Little Mermaid, Haunted Mansion, Winnie the Pooh, Big Thunder Mountain.. "EVERYONE GETS AN INTERACTIVE QUEUE! You get one, and you get one, and you get one..." But whereas the interactive queue's kind of work with the fantasyland rides, the one with the Haunted Mansion makes absolutely no sense. Also...it looks like you may not be able to skip the interactive queue anymore. We went to Disneyworld for my College spring break about two weeks ago. Other than the fastpass+ system, I had a blast (as always) except for one thing. Because they have now added a fastpass system to the Haunted Mansion, those waiting in the standby line are now FORCED to go through the interactive queue while fastpass users get to walk straight to the front doors. Also, because fastpass+ only allows for three fastpasses a day, it means you now have to go through the queue almost every single time you want to ride the HM...this is infuriating. All I can do is just keep my head down and pretend as if that damn queue doesn't exist...it's still my favorite ride in the park, and i'm still going to ride it every single time I go to WDW..but man this is depressing. Another small thing: The pet cemetery is still there, but for some reason the Mr. Toad statue is gone. I looked for it in the queue, at the exit of the mansion, anywhere remotely close to the ride but it's nowhere to be found. The other pet tombstones are still there but Mr. Toad has vanished. Heheh...I actually enjoyed the interactive queue, despite being a huge mansionite myself. But then again despite adoring to ride to pieces, I never take things as seriously as the rest of the folks. When I went to Disney World for my quinceanera, I positively lit up and just began playing with all the stuff and getting excited when I understood what they were referencing. But then again, despite now being 18 I still am just an excitable 5 year old on the inside whenever I go anywhere near Disney. So I'm not bothered by continuity errors in the slightest. I guess I'm just content with having my head in the clouds! My feeling about all that is mitigated. On one side, it's true that taken as a whole, that queue is ridiculous. 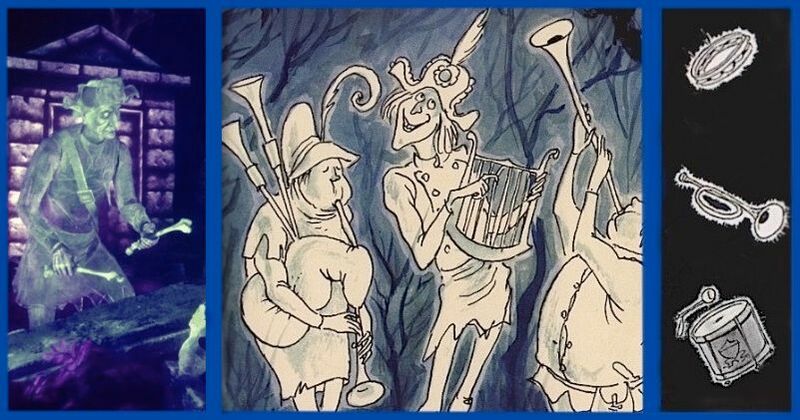 But I happen to prefer Marc Davis's original comical concepts to some of the things that were eventually portrayed in the ride. And also… you said "when a thing becomes so self-referential, that indicated decadence". In our case, that's true, but that can't be a continual rule. Take the Donald Duck comics for example. Some of the funny things in the Don Rosa comics are a considerable amount of references to other Disney comics (mainly Carl Barks's). But when it stops being funny and indicates decadence is when there is nothing BUT self-references. I think that they can put as many tributes as they want, but that they should mix them with new stuffs on the same time. Whenever self-referentiality is added to a major, coherent work that had no trace of such irony to begin with, you have decadence. Here, we have a ride that simulates a visit to a real haunted house, with a new prelude that says, "Hey, how about this wonderful simulation of a haunted house, eh? Pretty cool, eh?" That practically screams DECADENCE. Stil questionable. Part of the thing is the question: are you already in the attraction when you're in the queue ? You could consider that it's like a generic of a movie like, say, the 1968 "The Pink Panther". This generic plays on what you are going to see, but makes it incredible. It's not because the animated Panther can play with the fourth wall, interact with the anthropomorphized glove of the main villain, and so on, that during the movie itself, Clouseau will be able to talk to the anthropomorphized glove of his nemesis, tell the audience that he's in a movie, and walk in the air while boxing with the text of the generic, huh ? You know, it still wouldn't be great, but I'm struck by how much better this stuff would have been as an after-show where guests exit the ride. That way,the comedic tone doesn't spoil the ride's initial scariness, and they would still be able to get their tributes in. Oh, sure, the stuff is still obnoxious, but it would be much easier to discount if it was placed properly for the HM arc. I agree. If it were physically off to the side, it wouldn't be necessary to integrate it into the imaginative world of the HM. It could be interpreted as exactly what it is: a tribute. Those who want to take it as part of the actual show could still read it that way if they so chose. We'll just have to agree to disagree on this, I guess. I think the original DL HM queue (i.e. without the hearse or pet cemetery) was the most beautiful queue they ever did, and even with those additions it still takes the prize. A lot depends on whether you're a garden person or not, I suppose. You might check out the two "Stroll Around the Grounds" posts for a different perspective (June-July 2013).